Home > News > Beautiful new concrete driveway recently installed in Altrincham! Beautiful new concrete driveway recently installed in Altrincham! Lasting Impressions was recently asked to install a new driveway in Altrincham, Cheshire. This pattern imprinted concrete driveway was positioned across the full expanse of the front of the house with areas to both sides of the driveway left available to incorporate borders for flowers and shrubs. That’s the great thing with pattern imprinted concrete driveways, they can be installed into an area that is any size and shape. 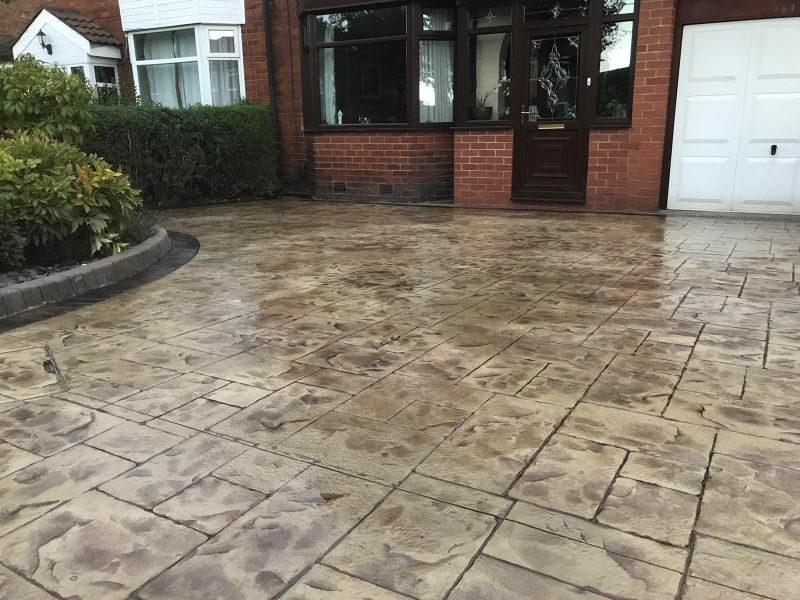 For their new driveway in Altrincham, Cheshire, our clients opted for the Ashlar Cut Stone pattern which was coloured in Steadman Buff with Mahogany release. You can see the effect that this created from the photographs included. We also added an acid stain to the edges which gave definition to the borders and created a great finished result. The final part of the process was to cover the whole area with a mid-sheen seal which was also anti slip. To install a new concrete driveway professionally and with a quality finish, good organisation, excellent time-keeping and preparation are needed in order to get the pattern stamps that create the imprints covering the entire area of the driveway before the concrete sets. At Lasting Impressions, we have the many years of experience that are needed to do this. We also aim to keep the potential inconvenience involved in having a new concrete driveway right outside your house to a minimum. While imprinted concrete can be walked on a day after it has been installed, during its setting time it needs to be left untouched. We will put planks down securely on your concrete driveway between the doorway and a firm piece of ground. If this is not appropriate, we have various alternatives to find a safe solution. 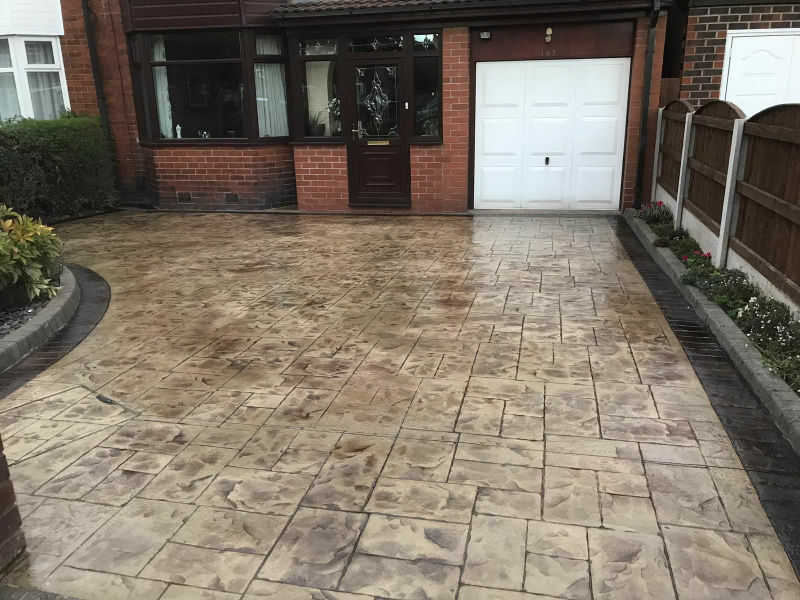 To find out more about having a new driveway in Altrincham, Cheshire, give Lasting Impressions a ring today on 0161 980 8822.